With a synergized workspace dedicated to your favorite Topaz tools, photoFXlab™ complements your existing Topaz workflow - giving you the perfect Topaz workshop to create stunning photos. Built for convenience, flexibility and simplicity, photoFXlab™ will help boost productivity and transform the way you edit with Topaz. Use the searchable effects library to explore and apply presets without having to access your plug-ins. With over 500 effects, the possibilities are endless! 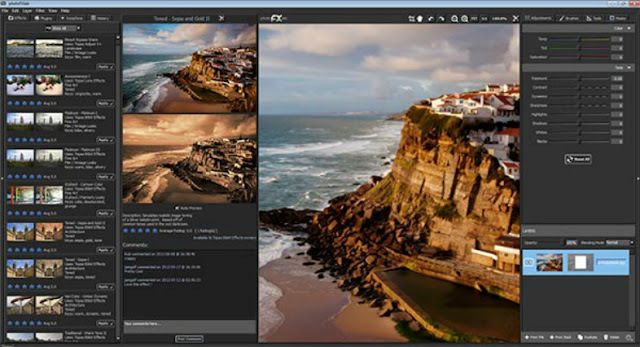 And if you want to make your own effects, photoFXlab™ offers speedy access to all of your Topaz plug-ins. See here for details. Refine your enhancements using the convenient adjustment sliders and editing tools, featuring the new IntelliColor™ technology.